Submitted by editor on Mon, 04/25/2011 - 18:06. Helalia Johannes won the Two Oceans Half Marathon in a new record time of 1 hour 11 minutes and 56 seconds on Saturday. 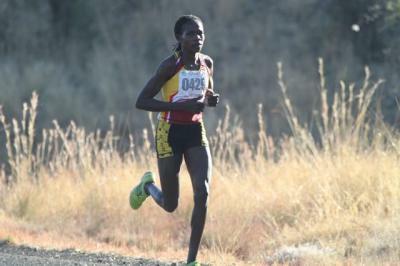 With the victory Johannes underlined her reputation as one of the continent’s finest long distance runners as it was the fourth time over the past six years that she had won the title. Johannes said it was a tough race but she felt elated at winning in a new record time. “It was a very tough race, but I feel fantastic and I’m very proud of myself that I broke the record. Rene Kalmer broke my record last year when I did not run, so I was determined to take the record back,” she said. Johannes received tough competition from Irvette van Blerk of South Africa who was involved in a titanic battle for the lead. The two set the pace from the start but Johannes opened up a gap after 5km. Johannes said her legs felt ‘heavy’ at 11km as she dropped her pace and was overtaken by Van Blerk. Johannes soon recovered however and joined Van Blerk in the lead at the 12km mark. The two ran together till one kilometer before the finish when Johannes picked up her tempo and pulled away to win in a new record time, beating the previous record by 43 seconds. Van Blerk also broke the old record, finishing eight seconds behind in second place, while Zintle Xiniwe of South Africa came third in 1:14:58. Johannes, who had previously won the title in 2006, 2007 and 2009, thanked her training partners and Old Mutual for helping her to achieve her goal. “I want to thank my training partners at the Namibia Defence Force and Old Mutual who covered all my expenses for me to participate in Cape Town. It was a tough race and it’s not easy to break records, so I’m very happy,” she said.